Wink called, asking me to pick up some food for supper on the way home. I was in West End, where our business is located, and she mentioned Long John Silver’s/Taco Bell restaurant. I mentioned I did not know if it was Long John Silver’s anymore. I went by and the sign said Taco Bell, not a combination of restaurants as I do believe was once there. I went in and asked the girl behind the counter, a light skinned black girl, if this was a Long John Silver’s too anymore. She said no, but offered to look one up for me. I noticed she had a Silver Christian cross hanging from her neck and sensed a common Spirit between us. I said that is OK, I will just order something here. I finally figured out what we needed, with her assistance, and she asked for a name to place on the order. I said Cooper… (BTW., I am writing this in Cooper Black type set…) [This is not showing in this font on WordPress] She said, I am a Cooper too, and explained that that is her name now or that she is related to Coopers in South Alabama and Jacksonville, Florida. I said, “Good, we may be related.” I told her my Great Great Grandfather was a conductor on the underground railroad, and asked her about her family history, but she did not know much about it.. I mentioned that I did not recall any of my ancestors having slaves, because we were from up North in Illinois, but that we could be related in some way. I offered her my hand and said, that it was good to meet her and we may be related. When the order came up, she brought it out to me and we struck up another conversation about the family name. She told me about her second cousin in Jacksonville, FL and thought of his name. I asked her if he was fully white or partially white, and she said fully white. I said we may be related, and told her about a Genealogical book my Brother, Joe had written, about our ancestry going back to the Mayflower. I gave her my business card and asked her to email me and I could share it with her. We hugged each other, and I told her my shop was right down the street, just over the viaduct, and asked her to come down to see me one day. God’s image. I still do not understand why we cannot all get along in the world…. I think we are all related; all of us brothers and sisters, and we should all love one another… I know I am naïve, but I hope to die that way…. What is it we cannot understand about the unconditional love of God, which is supposed to be in us, if we wear the cross around our necks, or symbolically carry the cross, or even if we are not Christians at all, that we do not understand about this love of God? Cooper White, – Cooper Black… What is the difference? I just can’t see any difference…. 1 And so, my most beloved and most desired brothers, my joy and my crown: stand firm in this way, in the Lord, most beloved. 2 I ask Euodia, and I beg Syntyche, to have the same understanding in the Lord. 3 And I also ask you, as my genuine companion, to assist those women who have labored with me in the Gospel, with Clement and the rest of my assistants, whose names are in the Book of Life. 4 Rejoice in the Lord always. Again, I say, rejoice. 5 Let your modesty be known to all men. The Lord is near. 6 Be anxious about nothing. But in all things, with prayer and supplication, with acts of thanksgiving, let your petitions be made known to God. 7 And so shall the peace of God, which exceeds all understanding, guard your hearts and minds in Christ Jesus. 8 Concerning the rest, brothers, whatever is true, whatever is chaste, whatever is just, whatever is holy, whatever is worthy to be loved, whatever is of good repute, if there is any virtue, if there is any praiseworthy discipline: meditate on these. 9 All the things that you have learned and accepted and heard and seen in me, do these. And so shall the God of peace be with you. 10 Now I rejoice in the Lord exceedingly, because finally, after some time, your feelings for me have flourished again, just as you formerly felt. For you had been preoccupied. 11 I am not saying this as if out of need. For I have learned that, in whatever state I am, it is sufficient. 12 I know how to be humbled, and I know how to abound. I am prepared for anything, anywhere: either to be full or to be hungry, either to have abundance or to endure scarcity. The Muslim man studiously and respectfully silently read the text for several minutes in deep thought as I silently watched. After a while he looked up to me and said, “It is very Islamic, isn’t it?” “Yes, it is,” I agreed, and we started another long and mutually respectful and, by the way, Peaceful, conversation. I told him about the Inter-Faith city wide Prayer Service I had attempted to activate a couple of months ago for the sake of the Refugees, both Christian and Muslim refugees and pointed him to my blog site, http://www.jcooperforpeace.org where I posted the Prayer Service. I told him my idea had already been shared with another of my Muslim friends, Mirza Beg, who was to forward it to the local Mosque, or Islamic Center as they call in here in Tuscaloosa. I asked him to talk it up and perhaps just a few of us could have a smaller event than the city wide event I had envisioned. Even though the Mayor of Tuscaloosa had agreed to help in any way he could, I could not garner support from the Christian churches I had contacted whom I was asking to host the event. We continued our conversation and the Muslim man told me he had been looking into the Spirituality of the Native American Indians. One of the American Indian wise sayings, he said, is: “If God created you a crow, you do not have to become an Eagle.” I told him I liked that and many Indian Spiritual sayings and I had recently been through an 8 or 9 month St. Ignatian Spiritual Exercise Retreat. I told him of the many ways I personally think God can reveal himself to us humans, and concerning the Indians we were talking about, that God can reveal himself and to Indians as one walks in silence through the forest, even without a word written or spoken, God can do this, as one walks in Peace. I mentioned that to me, God has revealed himself sometimes as a Father, sometimes as a Son, and sometimes as the Holy Spirit, but still, I believe there is only one God. I shared my idea that one could take all the knowledge of the American Indians, and the Jewish religion, the Christian religion, and the Islamic religion, and all the knowledge of the Atheist religion, and put them all in a bucket, stir them all up and dump them into the ocean, and it would not be a drop in the ocean compared to the vast knowledge of an infinite God. He understood, and I mentioned again the Scripture we had just read, although I did not quote it again at that time. Here is a principle part of it below. I don’t think he would have agreed exactly with the Jesus Christ part of it, but then, apparently many Christians do not believe it either, not understand it, in that many Christian folk like to be guarded by weapons, guns, and “Peacemaking” six-shooters, not by the Peace of God. It appears in America that the “tougher” and more one believes in guarding oneself, the better, especially in the Political realm. If you have not had any, I ask, why not? Could it be the Prince of the Power of the Air is getting through to us through the Media and the Political systems of this world? Why not turn off the Media for an hour or two a day and silently reflect upon your Scriptures, either your Hebrew ones, Christian ones, Islamic ones, or, even just take a silent walk in the woods, just like the Indians and reflect on the Peace God has very clearly said he came to give us, which goes beyond understanding. This Peace is a gift of Grace and Mercy. Yes, it does sound Islamic, but it sounded to Abraham, like a gracious and merciful God, before the Jewish people, before the Christian people, and before the Muslim people. It is a Grace that has extended to all Abraham’s offspring, which by extension is all mankind. Have you had any Peaceful thoughts lately? Accept this gift, get some of it; Let this be the year of God’s favor for you…..
My Brother, David Cooper, died yesterday, March 30th, 2012. He was nearly 4 years younger than I, and the closest sibling I have in age. I remember we would play together in the fields and woods of our family farm in Illinois… David was much bigger than I, standing over 6 feet tall, taking more after the McCulley (my mother’s) side of our family. He was a hard worker, and very strong. He is the one who called me a book worm. I would read and he would do outdoor activities to a greater extent than I, although I also did outdoor activities. He, as a young man, became involved in what the majority of Evangelicals call a cult, the Jehovah’s Witnesses. I, as a young man, also became a member of what some Evangelical types also would call a cult, the Worldwide Church of God, a Sabbath observing and Pre-Millennial religious sect which has since become Evangelical in their belief systems. David was dedicated to his belief system, traveling to various locations, including Mexico, where his Spanish speaking skills could be used to further his organization’s goals. He also had a kind heart, although apparently a weak one. He would nearly every day help put my Uncle, Bill McCulley, (suffering from end stages of Alzheimer’s) to bed and assisting my aunt, Joan McCulley, in various ways in taking care of him. Most of the time, I attend a 6 AM Friday men’s prayer group at Grace Church, a nondenominational church that I now attend. That Friday morning, before I knew of David’s death, while he was still on life support before they would attempt to take him out of the induced coma he was in, several of us in the prayer group prayed for David. One of my friends, a conservative Evangelical type, well meaning as he was, asked me, “Does David know the Lord?” Sensing what he meant, I told him that David would say he did, however he was a member of the Jehovah’s Witnesses. I well knew that some Evangelical types do not believe other religious types will experience Salvation and Eternal Life. Anyway, this person and several others in the room offered up prayers in his behalf. I truly thank them and thank everyone in the community and the church I attend for their support. I have written a previous essay, on this blog site, entitled, “My Brother in a Box”. It is with regret, I write another essay, “My Brother in an Urn.” David choose to be cremated. His remains will be placed in and Urn, not in a box, as was my infant brother, Paul. They burn people in China too, there is no place to bury 1.6 Billion people all over the place. Cremation is becoming more common here in the United States also. May I ask, Did my infant brother Paul, know the Lord? Do aborted fetuses know the Lord? Did other individuals, billions of them, before and after Christ, know the Lord? I think a better question to ask is, “Does the Lord know David? Does the Lord know you? To this question I can issue an definitive answer, although this answer will also be argued by certain conservative Evangelical types… The answer, and the Good News of the Gospel of Peace is, Yes, the Lord knows you, the Lord knows every sparrow that falls to the earth. God is Good… Not only that, but we can rest in the fact that God loves the whole world, and all, including sparrows, (http://www.youtube.com/watch_popup?v=lEH8VDhze7k), and humans, that are in it. We can remember that as in Adam all die, so in Christ shall all be made alive, although some will also argue with that. I am reminded as I write of a friend, who took minor issue with the last article I wrote too, where I quoted the Lord, Jesus, and Jesus’ statement “Blessed are the peacemakers, for they will be called the sons of God…” That is just not what this means, according to this individual, unless we are speaking of, I suppose, if I interpreted him correctly, unless of course this person who is a peacemaker knows the Lord…. I might add that there were no “Christians” in the audience of Ca. 5,000 on the plain where Jesus said this…. Does the Lord know you? I used to believe, after leaving the Roman Catholic Church, in observing the Sabbath, which by the way is from Friday at dusk until Saturday at dusk, in areas of the earth where it can be observed, that is…. I, the Lord sanctify you…. To me, if we keep the Spirit of the Sabbath, we will above all, above all the things we can do, the things we think we know, rest in the saving work of Jesus, which is NOT of our own doing…. We rest, He does… He is the one that Sanctifies every man, all this said, by the way, centuries before anyone “knew the Lord” They did know however, that it is the Lord that sanctifies, not our own efforts, not our own supposed knowledge of the Lord. Above all, they were to know it. Who can know an infinite, all wise, all knowing, all powerful, God who is everywhere, in all things, in you, in me, and who knows even the sparrow who falls to the earth, anyway? Our knowledge, my knowledge, of the Lord, and I believe my two friends (I am reminded of Job), knowledge of the Lord, is not very much compared with the Lord who knows us… It is the faith of the Lord, the faith of Jesus, who saves us and provides all that we need, life, food, clothing, and death when appropriate. The Lord knows…. Therefore, I do not attempt to sit in judgment of my brothers, David and Paul. It is not my job. I do rest in the finished work of the Lord. Jesus said, “It is finished.” We are coming upon the time of the year we need to reflect on that, the finished work of the Lord, that is. The Lord knows David, the Lord knows Paul, the Lord knows you! this is a part of the Gospel of Peace… I would be happy to share it with you someday… Now that the Lord does all these things and we can rest in his works already done, why not accept the Lord as he draws us to him? I truly believe, no one is lost, until they gaze into the irresistible Grace filled eyes of Jesus, and reject his love. I can only hope that very few will reject him, but all will increase in knowledge of the Lord forever and ever…. I have been trying to find Peacemakers lately… It reminds me of trying to find mushrooms. For those who do not know, at slightly varying times of the year in the Spring in certain areas of the North, and even in the south, if one knows how to look and what to look for, one can find delicious Morel Mushrooms. People come from everywhere to find these delicacies. As I write, April 28th, 2012, the anniversary of the terrible Spring storm in that hit Tuscaloosa, AL one year ago on this date, mushrooms are already being found in Illinois, where I grew up. I imagine they are growing on our family farm ground now and people are finding mushrooms. To find a mushroom, one must have sharp eyes, know where they may have grown in the past, but that does not prove they will be there the next year, take a stick and walk around in the woods or wilderness moving covers of leaves from the previous fall.. Sometimes great big ones seem to appear right before one’s eyes! Look on the North slopes, look where May Apples grow… Look all around, relax, don’t get too stressed out. Now, how does one find Peacemakers? To find a Peacemaker, one just goes to a Christian church and looks for followers of Jesus! Jesus seems to say we should be… Right? They are of course all Peacemakers! One has to look for Peacemakers, kind of like one has to look for mushrooms… Take a stick, stir things up, relax, keep an open eyes and an open mind, don’t look in all the regular places… Peacemakers do not all grow in Christian churches, in fact form my experience, unfortunately, not many grow in Christian churches, or in the U.S. Government, or in the Universities where one might expect to find courses in Peacemaking. Look everywhere, look in the Spring, Look in the summer, look in the fall, look in the winter..
Mushrooms grow as a fungus, when the conditions are right, in the right type of soil. So do Peacemakers. Peacemakers grow as a result of the infection of the Spirit of God, revealed to us in Jesus, and in others, such as Gandhi, Martin Luther King, Tolstoy, Gregory Boyd, and common folks, even me, where you can also find this fungus growing…. Look for it…. You might find it, if you care about it…. Taste it, if you wish…. I found some Peacemakers in Atlanta last weekend! I did not say that… Jesus did….. Check it out… I would never have imagined a Baptist Church like this. They planned the whole service around the visit of the Fellowship of Reconciliation, of which I am a member, and of which we have a chapter right here in Tuscaloosa, AL, imagine that! They asked us to sit on the front row, to be a part of the service, and for little children to come up and ask us where we were from, and look up where we were from on an Ipad, and look at the flag of our nation, and welcome us… I told them Alabama had a flag, Roll Tide, and everyone laughed! The songs were about Peace, the sermon was about Peace and given by one of their ministers who is a member of the Fellowship of Reconciliation, Lucas Johnson. At the end, we marched around the church Sanctuary, singing about Peace! Oh, they have women pastors too.. they have backs in there, a lot of people with theological degrees looking for a home, a lot peacemakers, I perceived. After church, one of the pastors, (a woman), hugged all of us… And men hugged each other too… Hugs are free! I have been too… disfellowshipped, I know the feeling… However, one needs to worship God somewhere….Everywhere, for that matter, since He is everywhere, even in these Peacemakers whom He claims to be his sons…. Anyway, I know this is getting a little long, but if you are looking for mushrooms, I have some tips… If you are looking for Peacemakers, I have some tips…. Some might say I have eaten the wrong type of mushrooms, the way I think about these things and all, but I think I know which mushrooms to eat:):) I am not dead yet, and keep kicking against the pricks of this culture which is indoctrinated in violence and war. There are holes in my shoes…. Thanks you for your leadership during your time in office to date. I had high hopes for America when you were elected and when you received the Nobel Peace Prize. Regrettably, since the beginning of your tenure, there are some of us whose hopes for a just and Peaceful and Nonviolent future for America and the world in which we live have been diminished. My immediate concern is regarding our apparent warlike approach to Iran. I realize the wisdom of your efforts in attempting to appease both Neo Conservatives, the Pro-Israeli population, and everyone involved in these matters, and your concern that Nuclear weapons will not proliferate. However we seem to have not learned a lot from our virtually 10 year experiences in Iraq and Afghanistan. Please give Peace and Nonviolence a chance….. The majority opinion of governments of the world and religions of the world is that Nonviolent methods of conflict resolution will not “work”. I feel it is unfair to speak like this, saying nonviolence will not work, without investing in Peace and Nonviolence in at least an equal way we invest in War. We have invested under your leadership, let alone the leadership of others who preceded you, Trillions of Dollars in war. War must be paid for, not only in the blood of our soldiers, but the blood of our perceived enemies, and in the future welfare of our young who are to be saddled with our folly. Let us invest in Peace. Before we dismiss Peace out of hand, because “Peace just doesn’t work”, let us invest in Peace, just a portion of the Ca. 7 Trillion dollars we have invested in war. Perhaps just a Billion or so to begin with, just for starters….. Do we not know by now, that “War does not work”? The investments we have made in war are clearly failures. Before Iraqing Iran, let us commit to spending 10% of our war budget investing in Peace. Let us invest in teaching methods of Peace and Nonviolence in the world’s educational, civic, political and religious infrastructures. Give Peace a chance….. Invest in it…. Let us talk about Peace, and dialogue about Peace and Nonviolence. Let us invest our time, financial resources, and prayers for Peace and Peaceful purposes, praying for our enemies, as well as our friends. Let us preach about Peace in churches, in prisons, and schools. Let us reject Hate and War, learning to be and actually becoming Peacemakers. Let us put our money where our heart is, if our heart is at Peace, and in Peace. I am personally doing this myself, and plan, if approved, to invest remaining funds of what little I have to go with The Fellowship of Reconciliation on a Peace Delegation to Iran in the first two weeks of May. If you, or anyone, for that matter, would like to help defray my expenses, and those of others going on this Peace Delegation to Iran, please feel free to do so. 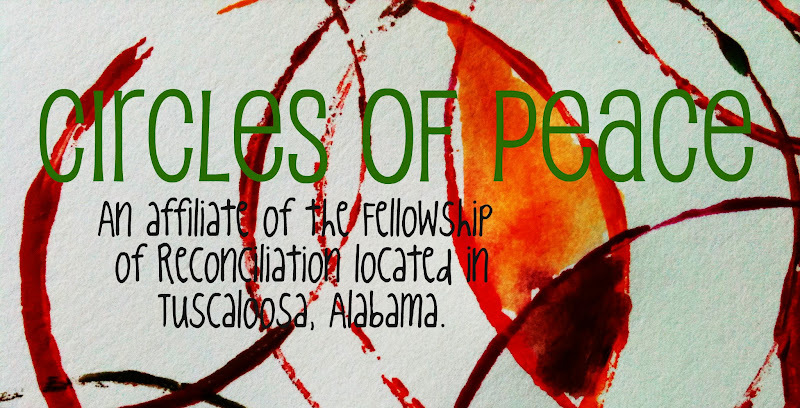 Your investment may be sent to Circles of Peace, FOR, http://tuscaloosacirclesofpeace.blogspot.com/, an Affiliate of the Fellowship of Reconciliation, P.O. Box 2757, Tuscaloosa, AL 35403 (My personal expenses will be about $5,500, or, although I have not asked FOR, directly to the Fellowship of Reconciliation, http://forusa.org/, at the address on their web site. You may contact someone there for the number of people who will end up being in the Peace Delegation and how much is needed. However, to be clear, this is not about me. It is about the future of our nation, and of our world, of beautiful human beings both here, in Iran, and all over the world who will be affected by our decisions regarding our future investments. Will our investments grow and bear fruit, or decay, and rot away? Also, there are many other worthy organizations struggling to invest in Peace and Nonviolence throughout the world… Please divert some war dollars to all of us attempting to be Peacemakers, and invest in Peace and Nonviolence. I will also copy our Senator from Tuscaloosa, whom I have met, Richard Shelby, whom I understand has something to do with our investments in war. The zone of immunity for Peaceful resolution in these matters appears to be rapidly approaching…. Let us invest in Peace now. 1.) The Holy Bible, Reprint of the Edition of 1611, exact facsimile – copy #134 of 250, Oxford University Press, 1985. 2.) In the Grip of Grace, You can’t fall beyond His Love, Max Lucado, Word Publishing, 1996. 3.) Martyr’s Mirror, by Thieleman J. vanBrahught, Herald Press, first published, 1837. 4.) The Myth of a Christian Nation, by Greg Boyd, Zondervan press, 2005. 5.) The War of the Lamb, the ethics of Nonviolence and Peacemaking, John Howard Yoder, Brazos Press, 2004. I am realizing this a lot more than you probably had in mind for our new web site, but you can cut it down… Since I have written it, I think I will share it on my blog site to give those who read it some kind of idea about where I am coming from…. 5:1 Therefore, since we have been justified through faith, we have peace with God through our Lord Jesus Christ, 2 through whom we have gained access by faith into this grace in which we now stand. And we rejoice in the hope of the glory of God. 3 Not only so, but we also rejoice in our sufferings, because we know that suffering produces perseverance; 4 perseverance, character; and character, hope. 5 And hope does not disappoint us, because God has poured out his love into our hearts by the Holy Spirit, whom he has given us. The Scripture, I quoted at the beginning seems to infer that we have peace with God through this Jesus personage. I think it is a nonviolent type of Peace now, unlike the definition of Peace thousands of years ago, and still in use today, in some circles, where Peace is defined quite differently, as primarily the absence of war…. Grace is mentioned too in this Scripture, as seemingly having something to do with this Peace… Are Grace and Peace related to each other? I think so… I do not think Grace and violence are related to each other…. Grace and violence are aliens to each other. Grace is all about unmerited forgiveness and pardon by God to us for the wrongs done by us to God and to each other, and the wrongs we are still doing to each other, including God when we refuse to love, refuse to be peacemakers, refuse to disavow violence of all sorts, violence to each other, violence to our spouses, violence to our children, violence to our enemy, violence to our animals, violence to our environment, violence in our games, violence on our TVs, violence in war, violence in our movies, violence in our streets, and violence everywhere. We are Graciously forgiven by God, therefore, let us graciously forgive each other, and STOP It, Stop this violence now. Let us stop the cycle of violence….. I think Gracious people should think and speak more of Peace. I think Gracious people should think and speak more of Nonviolence. I think Peaceful and Nonviolent people should think and speak more of Grace. Grace and Peace, and nonviolence are related cousins, and should rise up to speak to each other, to embrace each other…. After all, if we are Christians, we should share the same genes, having been infected by this Spirit of Jesus, and if we are not Christians, we can be affected by the Spirit of Jesus, or the Spirit of the ONE Gracious God of the universe, if you wish….